The first promo poster for X-Men: Dark Phoenix has surfaced online. Or should we just say Dark Phoenix? Save for Logan, one common thread with every single one of the X-Men movies to date has been keeping the team's namesake in the title. However, this first promo poster, which is rather simple in design, axes that from the title and, were it not for a distinctive X at the end of the title, one less familiar with the franchise would be hard pressed to even know that this is for an X-Men movie. This poster surfaced at the Las Vegas Licensing Expo, which is happening right now. Many of the materials, such as this poster, are used for the purposes of this convention only and aren't necessarily intended to advertise the movie to the public. Still, even if this poster isn't official, the logo very well may be and it represents a pretty big change for the franchise. Though, considering how X-Men: Apocalypse was received, that may not be such a bad thing. Not only that, but the last time this storyline was adapted (very loosely) was in X-Men: The Last Stand, which is easily one of the worst entries in the franchise. So maybe setting this movie apart isn't such a bad thing. 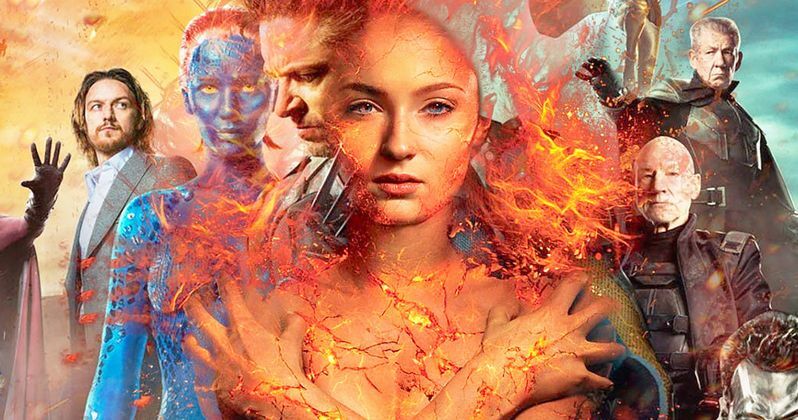 Fox was originally planning on releasing three comic book movies this year, with Dark Phoenix a part of those plans, along with Josh Boone's The New Mutants and the recently released Deadpool 2. However, both of the other movies have been delayed and will now see their release in 2019. Both movies needed some reshoots, which contributed to the delay. Instead of arriving on November 2 of this year, we'll now see X-Men 7 hit theaters on February 14, 2019, just in time for Valentine's Day. Long time franchise producer and writer Simon Kinberg makes his directorial debut with Dark Phoenix. The cast sees the return of James McAvoy as Professor X, Michael Fassbender as Magneto, Jennifer Lawrence as Mystique, Nicholas Hoult as Beast, Alexandra Shipp as Storm, Tye Sheridan as Cyclops, Kodi Smit-McPhee as Nightcrawler, Sophie Turner as Jean Grey, and Evan Peters as Quicksilver. Jessica Chastain has been cast as the main villain and, while there is still some mystery surrounding her, there was a rumor floating around that she will be playing Miss Sinister, but that has yet to be confirmed. Disney is in the middle of going through the regulatory approval process to purchase most of Fox's assets. That includes all of 20th Century Fox and the Marvel characters they own the rights to, which means Marvel Studios will in all likelihood be in charge of the franchise in the future. Unless Comcast gets in the way, but that is neither here nor there. That being the case, it's been reported that X-Men: Dark Phoenix may actually be the final core X-Men movie at Fox, even though they have been developing several other movies not connected to the main franchise. We'll have to see how that shakes out, but in the meantime, be sure to check out the poster for yourself below.